I love wearing red lipstick at this time of year. It is so festive and goes with a lot of different make up looks. I have tried too many red lipsticks to count and although I have found a few that I love, this one is my favourite. 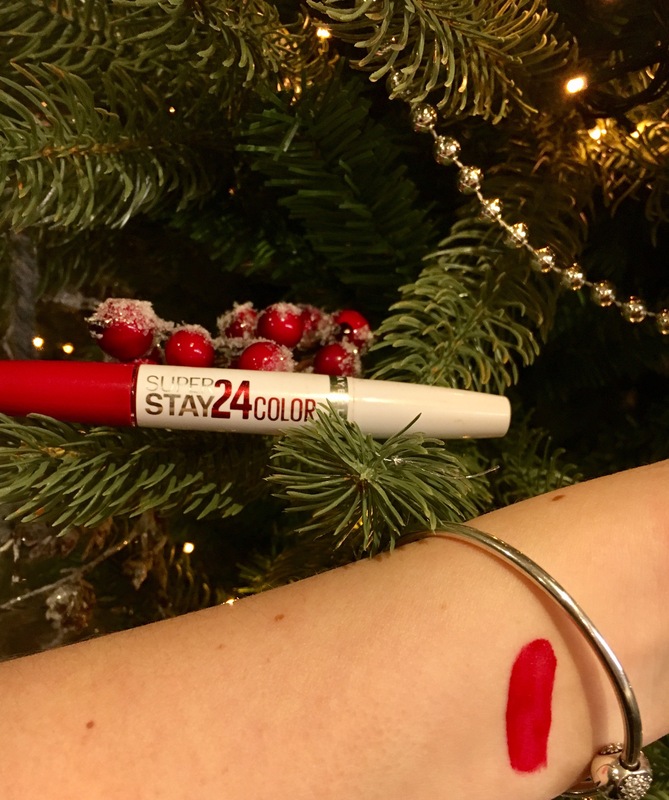 This is the Maybelline 24 hour super stay liquid lipstick. It is my go to and one that I will always repurchase! It is such a long lasting lipstick, unfortunately it doesn’t last 24 hours but it does last a very long time. I always call it my kissable lipstick as Ryan is always cautious of kissing me if I have bright lipstick on but this one doesn’t transfer at all. There are two parts to this lipstick. First of all you apply the liquid lipstick, I line my lips with it and then fill them in. You then need to leave it until it has dried and then apply the balm which seals it. I feel so comfortable wearing this and I don’t have to worry about it coming off throughout the day. It’s quite nice to re-apply the balm every few hours just to freshen it up. I have never noticed the colour bleed and it doesn’t feel dry on my lips. The colour I wear is 510 Red Passion. I buy mine in Boots for £8.99. Question! I LOVE long-lasting lipsticks/lipgloss but I STRUGGLE with 24hr ones because they are generally very drying!! What do you think about this one? Is it better? What?! Did I hear TRANSFER PROOF?!?!?! I need this in my life. Kissing-friendly products are a must during this time of the year! I have to try this now! !